​My portfolio featuring mods for "GTR2: Realism Redefined," by SimBin. ​Utilizing the gMotor engine that powers rFactor, GTR2 seems to offer a little extra to make it better than rFactor. Namely its ability to have AI racing makes it wonderful. I had bought this game earlier in January 2016 and haven't really played it until about May or June 2016. I had in mind a vision to make a game video featuring GTR2. The first attempt was with taking one mod and making a skin for it. Then later, I attempted to take one car to come up with a One-Make racing series to serve as the primary project of my video project. 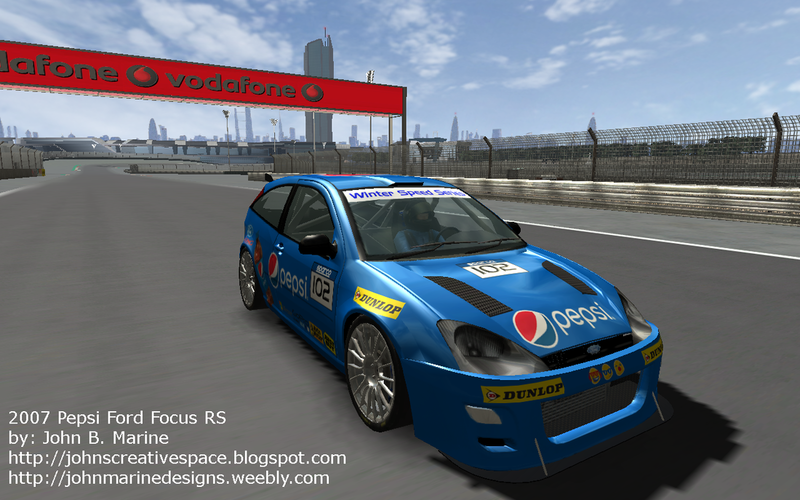 So what I did was come up with a livery for a mod for the 2009 Ford Focus RS Cup for GTR2. The car's livery was meant to be a template. The colored options include the main body of the car and the secondary color accents. So in this picture, the purple car color, the yellow secondary colors, and even the windshield banner could be adjusted. All cars bear the Mercedes-Benz logo and colors as well as the Sephora sponsorship on the hood/bonnet. By the way, this car is part of a GTR2 mod featuring the 2009 Mercedes-Benz C63 AMG. While not my first GTR2 skin, it was one of the first real liveries I created for any mod in GTR2. 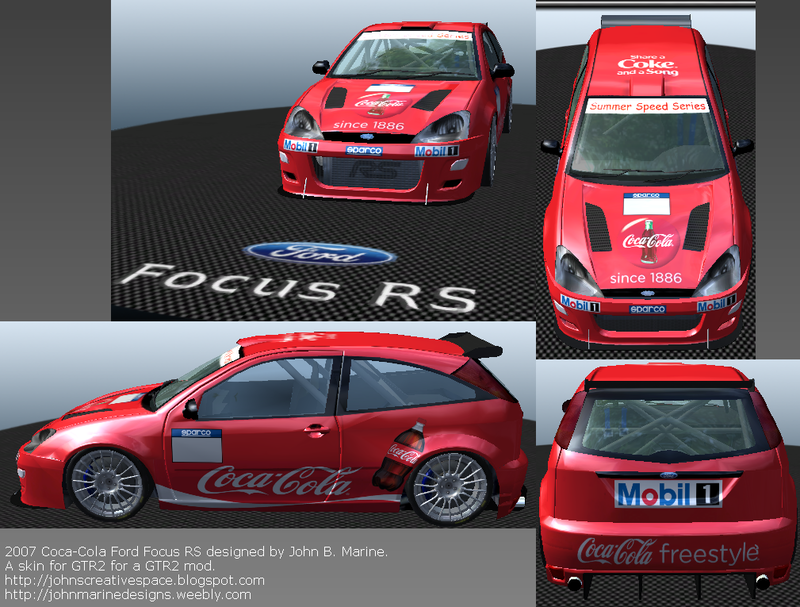 This car features Coca-Cola livery to coincide with a video project I was working on. I made a video featuring this car. To see my video, please take a look at this: Coca-Cola Summer Speed Series. In addition to making one livery for the Ford Focus RS, I made a second car. This car is a spinoff of the Summer Speed Series, and it is called the Pepsi Winter Speed Series. The entire car is the same as the other model, only that this model is adorned in Pepsi colors rather than Coca-Cola. This car is the Audi R8 LMS GT3 adorned in the blue and gold colors of my fictional motorsports team- Moonlight Motorsports. This car is part of a GTR2 mod called FIA GT3 2011. The car's primary sponsor is Samsung. Previously, I have NEVER made a skin for an open-wheel car or any kind of formula racing car. 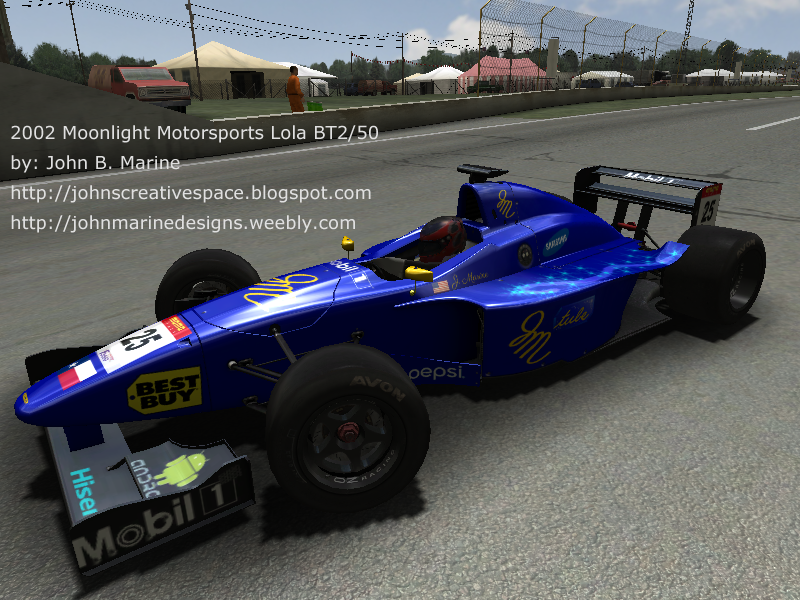 That all changed as I modified this 2002 Lola BT2/50. These are the F3000 cars from the RACE series from SimBin. This car was designed in support of an online friend of mine. "Sixxgunjohnny" created the sim racing league, the Ministry of Speed (not to be confused with the Ministry of Sound, which I think is purely awesome, but that's beyond the point). 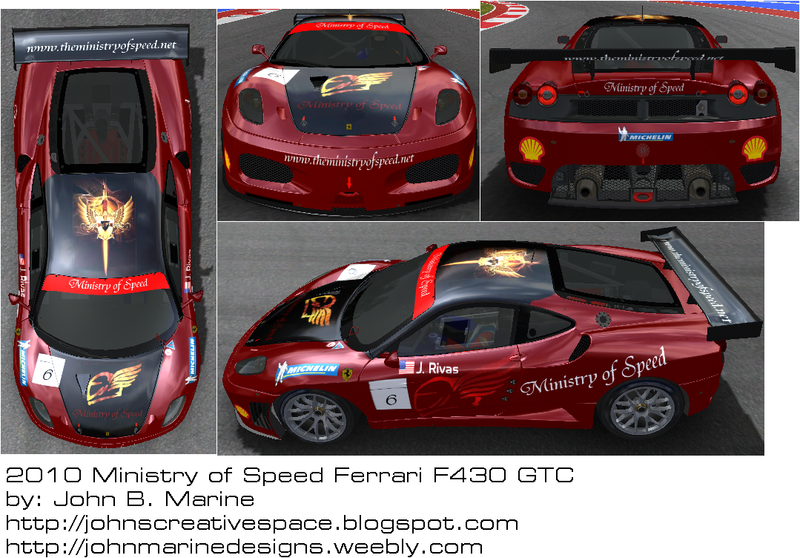 The mod is from GTR2 and is the Ferrari F430 GTC mod. The track seen here is Circuit of the Americas (COTA). For more information on the person's website I am making reference to, feel free to support my online friend by visiting the official site of the Ministry of Speed: www.theministryofspeed.net. Originally, I used a Saleen Mustang SE race car as my Pizza Hut race car. But since finding this fun-to-drive mod, this mod got me to designing a special Pizza Hut livery car. The car is designed as part of a One-Make Series I conceptualized using this car. The track in these pictures is Singapore GP 2008 for GTR2. As an off-topic note, I recommend you buy 3DSimEd to get all of the features without having to be bogged down by the trial limitations. It is a great tool to use to preview cars and tracks in a host of different racing games. 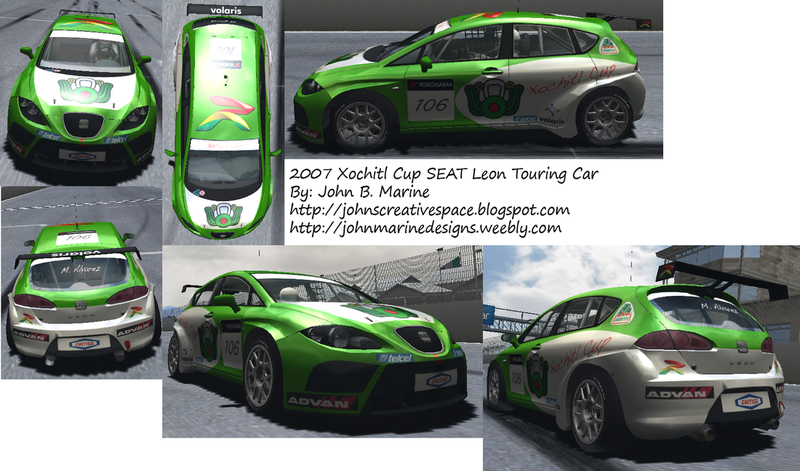 As part of a GTR2 project called the "Xochitl Cup" (pronounced "so-cheel"), this is a SEAT Leon touring car from 2007. I had a lot of trouble trying to get results I was proud of. I had to come up with image files for the windows and the driver. The work was rather tedious, but I was happy with my results finally when I finally put together my GTR2 project. By the way... this is a GTR2 conversion of cars from RACE07. 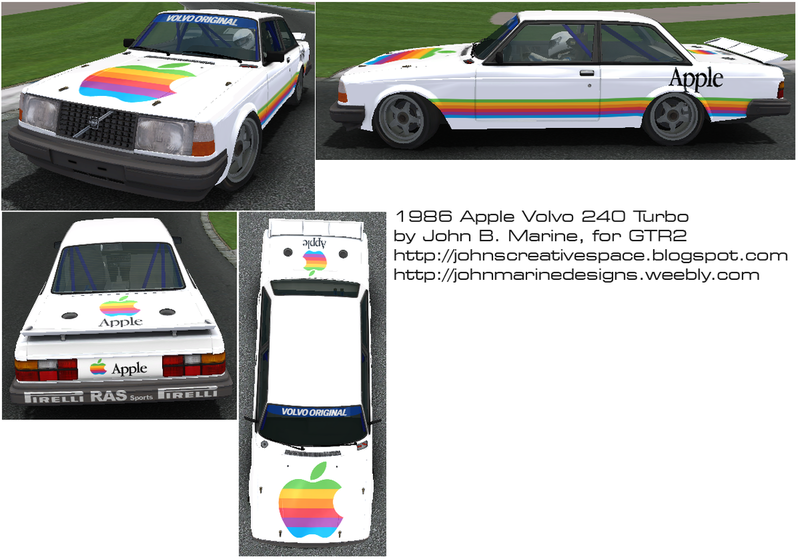 This is a 1986 Volvo 240 Turbo adorned in Apple colors. It was an attempt making a historically-accurate livery. This was one of my other attempts at a minimalist racing livery. 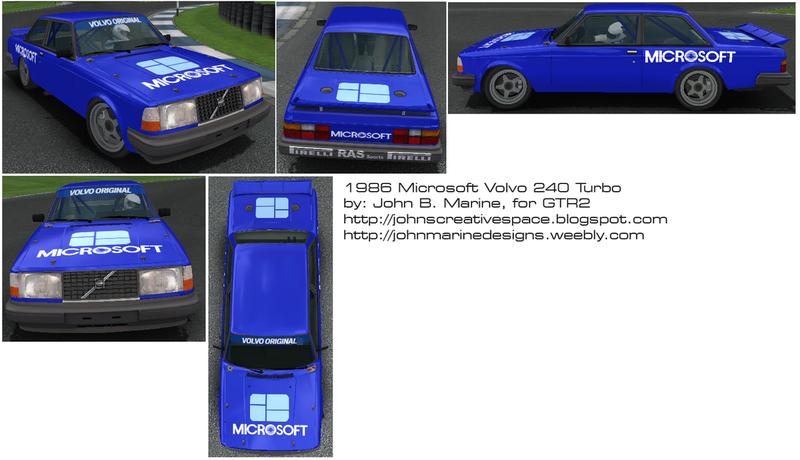 The car is a 1986 Volvo 240 Turbo with Microsoft livery. The Microsoft logo and Windows logos were about as accurate as they were in 1985.